sailboat. : Giveaway: Little Nell Jewellery! This is such a lovely give-away! I adore the Silver Tribal Arrowhead necklace and I will probably be buying it for myself if I don't win! Wowee, why have I NEVER heard of that jewelry before? It's absolutely beautiful. I'm a follower and I would love to be entered! Just checked out the online store - that "silver tribal arrowhead" has got my name written all over it! Thanks for the opportunity, darling. i absolutely adore the Antique Key Pendant! it would look lovely with everything this summer, simple but beautiful! oh, i also like your facebook page! 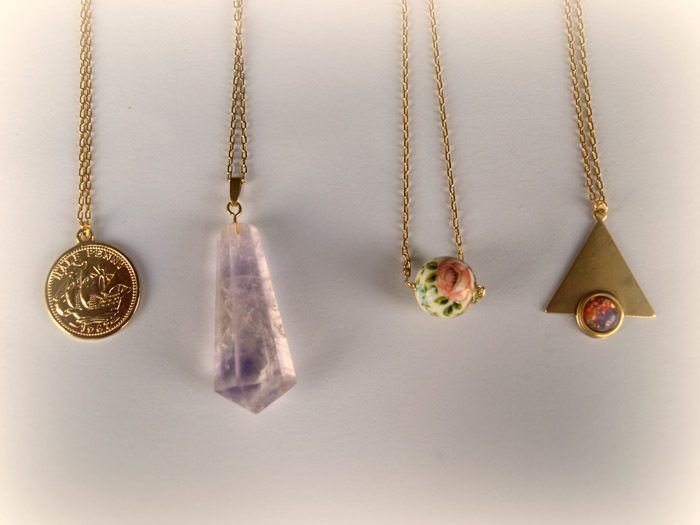 My favourite piece on the website is the gold amethyst crystal drop pendant - so pretty!! +1) I tweeted using the same name! +1) I've liked your facebook under Sophie Chapman! Would love to get my hands on that necklace, it's absolutely amazing!! My favourite item has got to be the gold amethyst crystal drop pendant. There are so many beautiful pieces I can't decide which is my favourite! I love the floral bead necklace, simply because I adore florals, but my love of history makes me love the halfpenny necklace. I love http://littlenell.bigcartel.com/product/half-penny-gold-coin-necklace this from the shop. It's really unique! and I've liked your fb page as Ria Kod. I love the aztec triangle pendant, its so unique and pretty. My name on twitter is @whatrosiegirl and my facebook name is Emily Sherriff. Have done all three options - my twitter is hels89 and Facebook is Helena Carr. I've also liked your Facebook page with my blog Helena's Blog! Love the antique key pendant! I love the antique key pendent. So pretty. my favourite item is the key pendant! Please enter me :) My fave item is the gold charm necklace with the clam shell charm! I love anything with seashells on! Great giveaway, I really like the gold amethyst crystal drop pendant. I love the amethyst crystal pendant! Following Little Nells on twitter and tweeted your giveaway. I'm chareggs. I've liked your facebook page as Charlotte Jane. I love the Azetc triangle pendant, I've not seen anything like this around! Love the gold amythest crystal pendant! Please enter me! 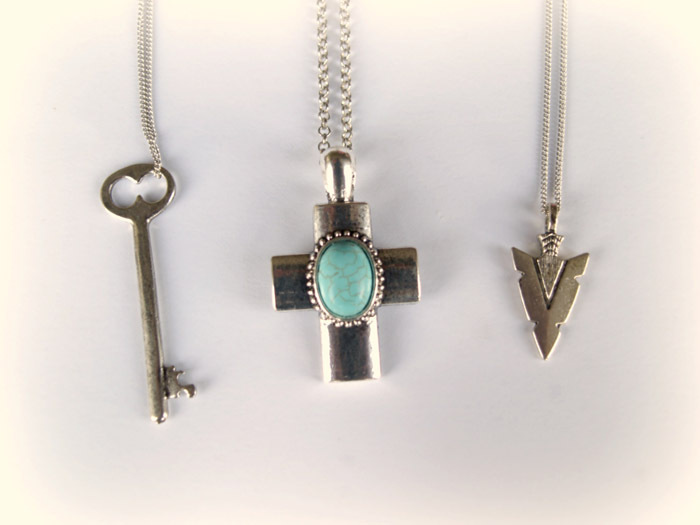 My favorite piece is the chunky silver and turquoise cross, so pretty! I follow you on GFC as Savannah. This jewellry is very nice indeed! My favourite items are the aztec triangles and arrowhead. of course i am a follower of your blog and have both followed little nell in twitter and tweeted about the giveaway via @fernlaura! My favourite item is the : Chunky silver and turwuoise cross neclace, it's so pretty! My favourite piece is the Floral Bead Necklace! I'm your follower and I'm following the Little Nell twitter and I tweeted too http://twitter.com/#!/glitterdetector/status/85455716881674240. This is my email glitterdetector@hotmail.com. I love the arrow head necklace! Never seen one before and I think it's fab! Great post, think I'll have to treat myself if I don't win anyway. Hehe! My faves are the aztec triangle pendants - gorgeous! Ooh I would love to enter, my favourite piece is the aztec triangle pendant! trigg.donna (at) gmail (dot) com. Ok so can I cheat and say I like the whole shop!?! I do love the aztec triangle necklace though...woweee!! Twitter - @Charli008, I follow you and Little Nell and have tweeted. I have also liked your fb page Charli James! I'm @annL on twitter & have followed Little Nell / tweeted the giveaway! I've also followed on fb! (I'm Ann Lin). I also follow via GFC!!! Enter me please! My favorite piece is the half penny gold necklace. my fave is the aztec triangle pendant. My favourite is the Aztec Triangle Pendant. Love it! I love the gold amythest crystal pendant! My favourite is definitely the half penny gold coin necklace! I love the unisex silver tribal arrowhead. It's so beautiful! I follow you on GFC as Anca and on Facebook as Anca Buruiana. Too many pretty things! After much deliberation I think this one: http://littlenell.bigcartel.com/product/unisex-silver-tribal-arrowhead may be my favourite though. My favorite is the Antique Key Pendant, by far! My boyfriend and i were in a long distance relationship for nearly two and a half years, and during that time he made me a necklace out of a key. Ever since I have loved anything having to do with them! I just love the Aztec triangle pendant! I love the antique key pendants! Gorgeous! Followed you on twitter : 30somethingmel and retweeted your giveaway too. Never heard of this brand before but it all looks so lovely. Such a nice giveaway. My favourite is the chunky silver and turquoise cross.